A stylish personalised honeymoon memories photo album or journal. This lovely album, will make a great keepsake, for all your precious honeymoon photos. 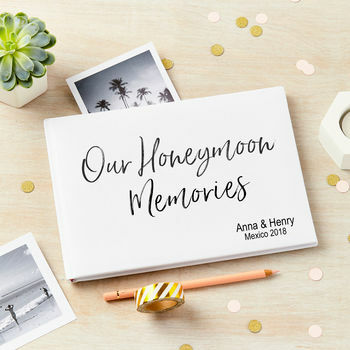 Could also be used as a journal or memory book, for things you have collected on you travels, such as tickets, restaurant menus and special places you have visited. Will make a great gift for the happy couple. Comes presented in a white box with a perspex lid.